Ok, what beter place to start than at the very beginning. Let me take you back to the year 1987. I’m 5 years old and my parents take me shopping to a big supermarket named GB. This chain also owns some family restaurants that are conveniently located next to their stores. When you order a children’s menu, you always receive a toy. Most of these toys were Chinese junk, but this time, I get my very first G.I.Joe 3 3/4 action figure, Blaster. Apparently I had been quite persistent in wanting more of these toys, because we went eating there 2 more times in the following week. Those meals gave me Blocker and the fantastic 1984 Storm Shadow. Unfortunately, when we went to eat there again, the deal with Hasbro must have ended and I got some lame toy car. But my interest in G.I.Joe was launched and my collection had to expand. Like I said before, the restaurant was located next to the supermarket. The concept of these stores was to not only sell food, but also non-food items, such as cookware, books, clothing and of course toys. So me being persuasive again led me to my first vehicle, the S.L.A.M. One never forgets his first Joe! Mine was Dial-Tone in 1986. My brother picked him out and gifted him to me. I soon had many, many more! 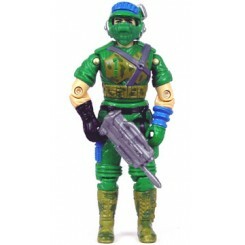 My first 3 3/4″ GI JOE was Snake-Eyes V1…I thought he was a villain. I couldn´t agree more. We always associate black with bad and white with good. You can´t deny the brilliance of the Hasbro Marketing team and Larry Hama is turning this around. Although Storm Shadow has changed allegiance more than once, he still is my favourite Cobra.